Phillips Chrysler Jeep Dodge Ram is the #1 Volume Chrysler Jeep Dodge Ram Dealership in North Central Florida and The Villages! We have an experienced and committed sales staff with many years of experience satisfying our customers’ needs in The Villages, Marion and Alachua Counties. Located in Ocala, FL we will help you find the right vehicle for your needs. Feel free to request more information about our used vehicles, set up a test drive or inquire about our auto financing options! 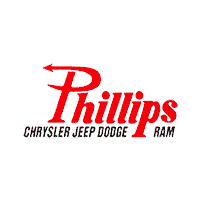 Whether you are looking for a new Chrysler, Jeep, Dodge or Ram, or pre-owned car, truck or SUV, Phillips Chrysler Jeep Dodge Ram is here to help. If you don’t see what you are looking for, simply fill out the Vehicle Finder Service form and we will let you know when vehicles arrive that match your search! If you would rather discuss your options with us, just give us a call at the toll-free phone numbers above. Click on Directions for interactive driving directions. We are located at 3440 South Pine Avenue in Ocala, FL. Please check our service specials and discounts on MOPAR parts and accessories. We offer shuttle service to The Villages! At Phillips Chrysler Jeep Dodge Ram, we offer new Chrysler, Jeep, Dodge, and Ram cars in Ocala, along with used cars, trucks, and SUVs by top manufacturers. Our sales staff will help you find that new or used car you have been searching for in Ocala. For years, our financial staff at Phillips Chrysler Jeep Dodge Ram has offered expert advice for those seeking a great Chrysler, Jeep, Dodge or Ram lease or car loan in Ocala. Our service doesn’t stop there. Ocala customers can come in and take advantage of our knowledgeable Chrysler, Jeep, Dodge and Ram car repair technicians and a fully-stocked inventory of Chrysler, Jeep, Dodge, and Ram car parts. You can reach Phillips Chrysler Jeep Dodge Ram any time by filling out our contact form, by calling us, or simply visiting our Ocala Chrysler, Jeep, Dodge and Ram dealership at 3440 South Pine Avenue.